Healing is not just for broken bones, cuts, and bruises. 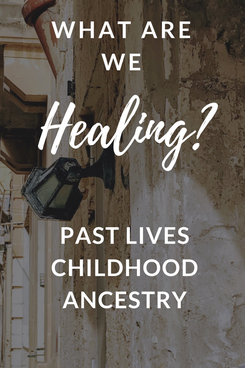 The healing we are now concerned with, has to do with the transformation of beliefs that I have held us back, in some way or form - from reaching our true potential. This could be a belief that our Inner Child held onto, interpreted as true, and continued bringing up into the present day life. But the ‘belief’ itself, was something said to that Inner Child from someone else’s hurt Inner Child. Many of us have had the experiences of going through phases of life where we felt that everything around us was/is crashing around us. The way of life that we knew, suddenly no longer exists and we’re ‘forced’ to Let Go. ...of those limiting beliefs. They served their purpose of teaching you what and how you truly are. You’ve made it through the muck. The pain in the neck, is just an example. If you begin to tie the basic emotional meanings of different physical pains to emotional beginnings, you can really make Transformational leaps in your own healing. I was often a 2 and 3. I’ve tried as many tools as I could before I was at a phase where I could afford to make appointments. At the same time, I do I have to bring up that not everyone carries around a lot of baggage. Per Constitutional Homeopathy, it tends to be that one person in a family unit tends to take up the loadof unresolved familial topics. The hope being, that somewhere along the lines, somehow and through the help of someone, healing/transformation will take place. Or, we could also get into a discusion about past lives, reincarnation, and how a distant past memory kind-of-glitches and finds itself influencing our present life experience. Which could benefit from a connecting to that memory, and using ones intuition to find the perfect reprogramming sentence that helps it heal/transform. All in all, though, we each have something we came here to experience. Maybe some of us have the pull to experience many ‘unresolved’ issues, journeying through their transformation, to serve as an example for others - that it is possible. Or perhaps, by going through so many experiences themselves, one day they will feel a drive to help others who have been or are going through similar experiences. Our multidimensional aspect, who is our ‘future self’, is the most whole and balanced version of ourselves that we want to integrate into our present day - Now. This is the reason and call for Healing and Transformations. We want to Integrate our Future Self, Higher Self. Being no better or worse than our present or past selves. Because she/he is also very grateful for all that we have experienced then and now. Those and All experiences, are what helped create our Future Selves.